In order to succeed at anything in life, you need to make a plan. Staying fit and healthy is certainly no exception to this rule. I admit, it can seem overwhelming to achieve, but one way to keep yourself on track is by prepping clean, nutritious meals & snacks in advance. This ensures you’ll always have healthy food on hand. Sure, if you’re not used to meal-prepping, it’s easy to believe the process is too laborious and costly, but in reality it doesn’t have to be. I have saved so much money in the past year while simultaneously improving my health, and it’s all thanks to meal prep. One of my favorite items to prep is this skinny apricot granola. Although it’s one of the first foods I ever prepped when I began my fitness journey, I still make it to this very day. Why??? Well it’s just that GOOD! Granola and I are clearly going to be BFF’s for life, because its super simple to prep and has countless options so I never get bored eating the same thing all week. Just by keeping this granola on hand, I’m always equipped with a quick and healthy snack, dessert, or even breakfast. You may wonder why I find this so important. It’s just granola after all, but it really is a big deal for me because it has prevented one of the biggest issues I had in the past…skipping meals. Most people think if they eat less they will weigh less, but that wasn’t the case. I skipped meals, I didn’t snack, and I was the heaviest I’d ever been. I either didn’t have the time or I was too fatigued to cook. This in turn led to years of obesity, as the metabolism slows when you chronically skip meals. Now that I prep items like this granola, I no longer feel sluggish all day because it prevents me from skipping breakfast on days I’m strapped for time. It prevents me from turning to unhealthy snacks and desserts when cravings strike. If the old me sounds like you…if you tend to skip meals a lot or snack on unhealthy items, try making a batch of this delicious granola. Simply sprinkle on your favorite yogurt for a quick and easy snack, layer between yogurt and heaps of fresh fruit for a quick dessert parfait, or just enjoy it straight up with milk or a milk alternative for breakfast. The possibilities are endless. I hope you give them a chance or come up with variations of your own! Preheat oven to 325°. Line 2 baking sheets with parchment paper. Set aside. In a large mixing bowl, add oats, almonds, maple syrup, coconut oil, cinnamon, ginger, allspice, and nutmeg. Toss to coat well. Spread granola out on prepared baking sheets. Bake until golden brown, about 12 to 15 minutes. Remove from oven, toss well, and bake for 5 more minutes. Remove from oven and let cool. Place cooked oat mixture in a large mixing bowl. Add coconut and apricots. Toss together until combined. Transfer to storage containers. Thanksgiving is only a few days away which means holiday baking has already begun or is about to begin shortly. A staple of most American’s Thanksgiving feast is the pumpkin pie. Although I love a slice of traditional pumpkin pie with a dollop of whipped cream I also enjoy developing desserts inspired by classic flavors. This year I chose pumpkin pie and created these pumpkin pie pudding bites to suppress my creative itch. Despite my love for pumpkin pie I understand it can be a difficult pie to master, especially for novice bakers. Anything custard based can be tricky and the smallest mistake can be all the difference between the perfect pie and disaster. Of course you can always buy a pie from the bakery or supermarket but many families enjoy the baking process and passing a dish they made themselves with love. That is where these pumpkin pie pudding bites can help. If you do not want to take on the task of baking a pumpkin pie from scratch but also do not want to miss out on the great taste that is pumpkin pie, these bites are the answer to all of your problems. Not only do these bites channel all the flavor and texture profiles of traditional pumpkin pie (with half the effort), they are also extremely portable and the perfect size for little fingers or those prone to overindulging. Try making them in place of a traditional pie if you need a quick last minute dessert, as a portion controlled offering for the health conscious, a mess free treat at the kid’s table, or as an interesting addition to your classic offerings. Combine 6 tbsp. sugar and cornstarch in a saucepan over medium heat. Combine the milk and egg and stir well with a whisk. Gradually add the milk mixture to sugar mixture, stirring constantly, and bring to a boil. Cook for 1 minute, stirring constantly, then remove from heat. Combine pumpkin, vanilla, cinnamon, salt, and nutmeg in a bowl, stirring well. Slowly add the pumpkin mixture to the milk mixture, whisking constantly. Place pan over low heat and cook for 3 minutes, or until thoroughly heated (do not boil), stirring constantly. Transfer pudding into a bowl and cover surface with plastic wrap. Chill. Meanwhile, line a baking sheet with foil and coat foil with cooking spray. Place the remaining 2 tbsp. sugar, walnuts, and dash of salt in a small skillet. Cook over low heat until the sugar dissolves and is golden, about 3 minutes, stirring frequently to coat nuts. Transfer nuts to the prepared baking sheet and cool completely. Once cool, coarsely chop nuts. Prepare puff pastry shells according to package directions. Cool completely. Place cream in a bowl. Beat with a mixer at high speed until stiff peaks form. Fill shells with chilled pudding. Top each filled shell with a dollop of whipped cream and chopped nuts. Serve immediately (if not serving immediately, wait to whip the cream and top bites). In the south, banana pudding is a quintessential summer dessert. It is a valued traditional fare like cheesecake is to New Yorkers. Despite all of its southern charm, traditional banana pudding harbors an enormous amount of calories and saturated fat. As much as I love traditional recipes they don’t quite fit into a healthy lifestyle I try to lead. I needed to find balance, a way to slim down traditional recipes without losing their classic flavors. I usually have bananas on hand because both of my daughter’s love them. Problem is both of my daughter’s love them and the second I use them for a recipe they will request them all day and refuse to eat anything else. Thankfully, my preschooler has been particularly picky lately and has not been requesting bananas while my youngest has had tummy troubles from the formula to milk transition and definitely does not need anymore binding foods. This caused my bunch of bananas to hit the overly ripe stage and make them free to use for baking. Now that I had bananas I had to figure out how to shave down the average traditional recipe’s 800 calories, 49 grams of fat, and 19 grams saturated fat without losing the taste everyone falls in love with upon first bite. My first idea was to enhance the banana flavor in order to compensate for the loss of richness sacrificed along with the heavy cream. I know from my culinary school days that when you roast a banana the naturally occurring sugars concentrate and take on a caramelized flavor. This would allow me to boost the flavor of the custard and reduce the amount of added sugar as well. The only problem with this approach is the texture of the roasted bananas becomes too soft to slice for the banana layers that adorn the custard base. My solution was to roast only the bananas needed for the custard as they would be mashed anyway and keep the sliced bananas fresh so they would retain their shape and texture. To finish up my recipe makeover I swapped 2% milk for the heavy cream or half & half found in traditional recipes. The added richness from the roasted bananas more than made up for the taste lost along with the fat. For the topping I used light whipping cream over heavy cream to save even more calories and fat. Even though the whipped topping doesn’t hold a stiff peak like it would have if made with heavy cream, it is not necessary for this recipe. After all the tweaking, this recipe saves over 500 calories, 44 grams of fat, and almost 17 grams saturated fat per serving without losing a bit of good ole’ southern charm! Note: If you are not serving the entire pudding right away you will want to prepare just enough whipped cream for what you are serving rather than spreading the full amount across the entire pudding as the final layer. This whipped cream is not stabilized in order to save calories and fat so it will lose its hold over time (approximately 2 hours of holding time). Rather than ruining the entire pudding due to weeping, simply whip up some fresh whipped cream with each serving. Preheat oven to 350°. Line a baking sheet with parchment paper. Place 2 unpeeled bananas on the prepared baking sheet. Bake for 40 minutes. Carefully peel and place roasted bananas in a small bowl. Mash with a fork until smooth or use an immersion blender. Peel and cut remaining bananas into ½-inch thick slices. Combine milk and 1/3 cup sugar in a saucepan over medium-high heat. Bring to a simmer but do not boil. In a medium bowl combine milk, remaining 1/3 cup sugar, cornstarch, salt, and eggs. Stir well with a whisk. Gradually add the hot milk mixture to the sugar mixture, stirring constantly with a whisk. Return the newly combined mixture to the pan and cook over medium heat until thick and bubbly, stirring constantly, about 3 minutes. Remove from heat and add mashed bananas, butter, and vanilla, stirring until the butter melts. Place pan in a large ice-filled bowl for 15 minutes or until mixture comes to room temperature, stirring occasionally. Whip cream to stiff peaks. Fold half of the whipped cream into the cooled pudding mixture. 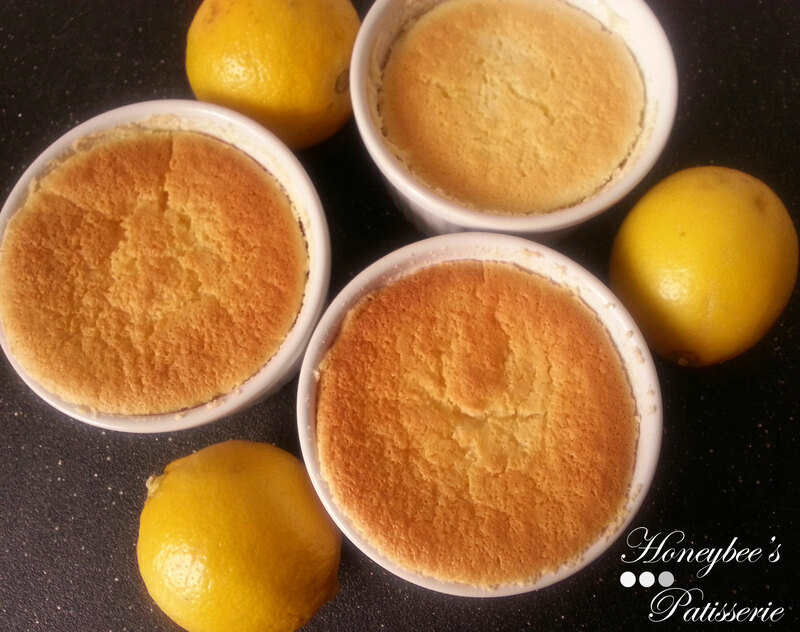 Spread 1 cup of custard evenly into the bottom of an 11-x-7 inch baking dish or individual ramekins. Top with 20 vanilla wafers and half of the banana slices. Spoon half of the remaining custard over the banana slices. Repeat procedure by placing 20 vanilla wafers, remaining banana slices, and remaining custard. Spread the remaining whipped cream evenly over the pudding layers. Crush the remaining 5 vanilla wafers and sprinkle over the top. Refrigerate for 1 hour or until chilled. Serve. We still have a few more weeks of winter before we officially hit spring despite many places across the country experiencing milder temperatures than usual. For many across the nation, winter is a time when it is harder to find fresh, in season produce to utilize. Citrus is currently one of the select finds currently in season across the nation and in abundance this time of year. 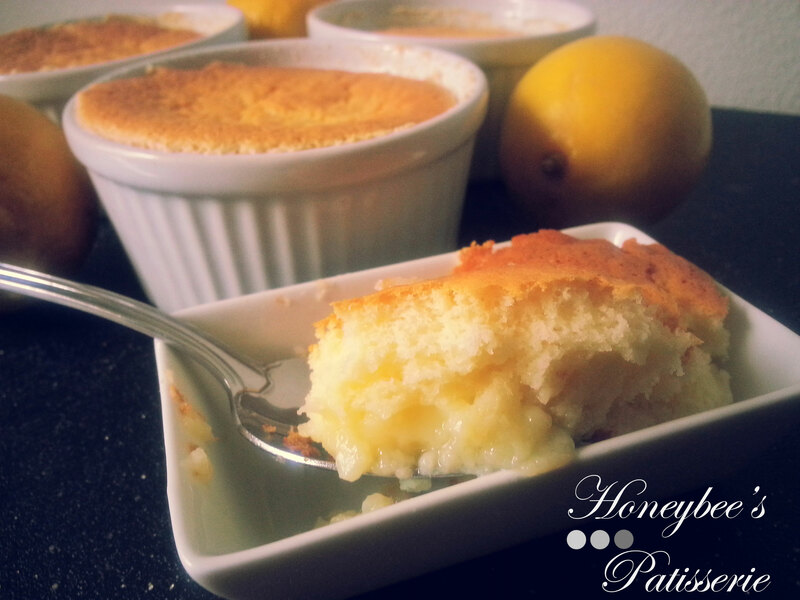 If you find yourself with a lot of citrus and want to experiment with something new than this recipe is just for you. Some of you may look at this and be confused thinking it is more like a citrus curd and not a pudding, but I assure you it is indeed a pudding. This pudding uses cornstarch as a thickener and a curd does not use cornstarch. If you begin eating this with the mindset of a traditional pudding you will probably be a little shocked. It is tart so be warned. Don’t be tempted to add more sugar. If you want it to be a little tamer than I suggest cutting back on the orange zest by ¼ tsp. If you are looking for a different type of light dessert that is inexpensive and easy to prepare than give this recipe a go. It surely will not disappoint! Combine the sugar and orange zest in a small saucepan; crush with spatula or a wooden spoon to excrete oils of zest into sugar (sugar will turn yellowish-orange in color). Stir in the tangerine juice, orange juice, cornstarch, and salt. Bring to a boil, stirring constantly. Boil 2 minutes or until thickened, stirring constantly. Remove from heat; stir in lemon juice and butter. Pour the pudding into a bowl; cover surface of pudding with plastic wrap and chill. Place cream in bowl and beat with a mixer on high speed until stiff peaks form. Fold half of the cream into the pudding. To serve: Spoon ½ cup pudding into dessert bowls or glasses. Top each serving with 1 tbsp. of whipped cream and a sprig of mint (if desired). Today I was trying to finish my family tree on Ancestors.com to one day give to my daughter and any other future children so that they will know where they came from. While taking a break from my research I decided to bake. 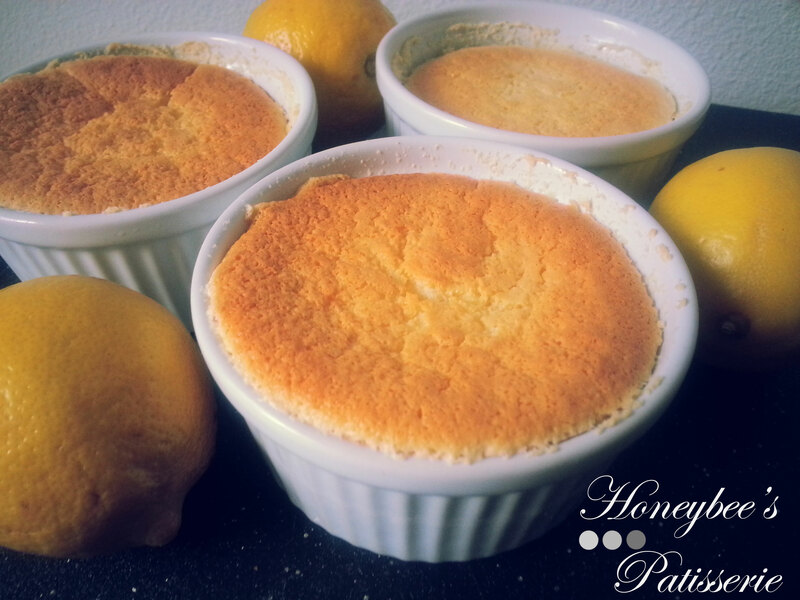 Sticking with the theme of the past I chose to make a forgotten recipe I came across a few years ago called Lemon Pudding Cake. 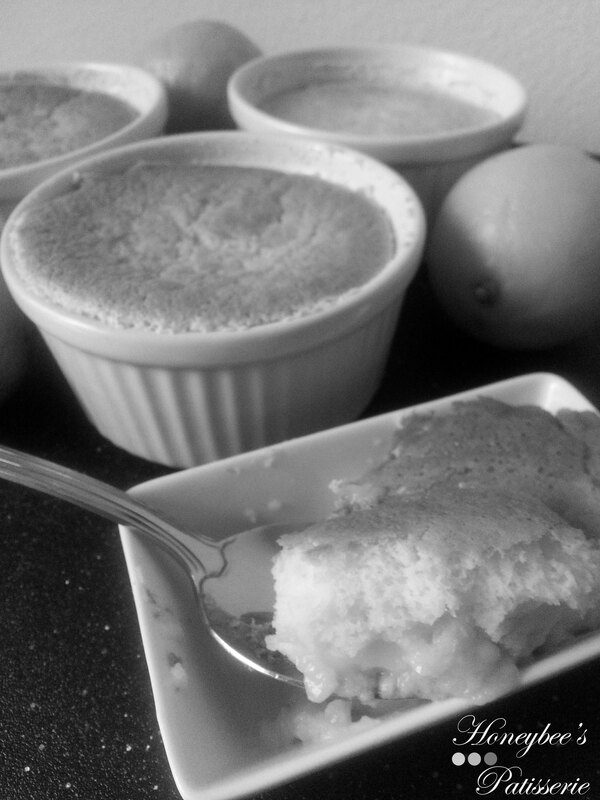 This cake is thought to have been a variation off of flour puddings from the late 1700’s like one found in Amelia Simmons’ 1796 cookbook “American Cookery”. Although the flour pudding recipe from Ms. Simmons is said to be an abomination to our modern taste buds, I must say this lost recipe is magical on so many levels. Not only does it taste great but one batter manages to create two separate layers… the top being airy like a souffle and the bottom dense and creamy as a custard. Although considered a cake, this dessert is somewhere between a cake and a custard. You may be wondering what causes such culinary sorcery. Well it all starts with the batter, which is rather atypical. It contains very little flour, a ton of egg, and a lot more liquid than usual. It is the large amount of liquid that actually causes the magic. The water in the liquid ingredients actually sinks to the bottom of the dish and takes the batter with it. This leaves the egg whites to float to the top and give the airy souffle-like cake over the custard base. Although practically forgotten in our modern era this cake has proven to me to stand the test of time. I’m sure my grandfather would have loved to have tried this since he had such a love for Lemon Meringue Pie and this has all the same tastes of Lemon Meringue Pie but in a cake/custard hybrid. Notes: To have the most prevalent lemon flavor, it takes fresh squeezed lemon juice and a bit of lemon extract. Do nut use bottled lemon juice. Be sure to use the cornstarch and not substitute more flour as it firms the custard base without distracting from the lemon flavor. To prevent the top layer of egg whites from deflating, add the sugar slowly and evenly over the egg whites while whipping. This will help stabilize them and result in a high, fluffy golden cake. To keep the custard base from curdling like scrambled eggs while baking, it is essential to put the ramekins in a hot water bath. This keeps the base from cooking too quickly and results in a creamy custard. This formula serves 6 and is best served warm or at room temperature the day it is made. Adjust the oven rack to the lowest position. Heat oven to 325°. Grease 6 Ramekins and place inside a large roasting pan. Mix flour and cornstarch together in a bowl. Set aside. 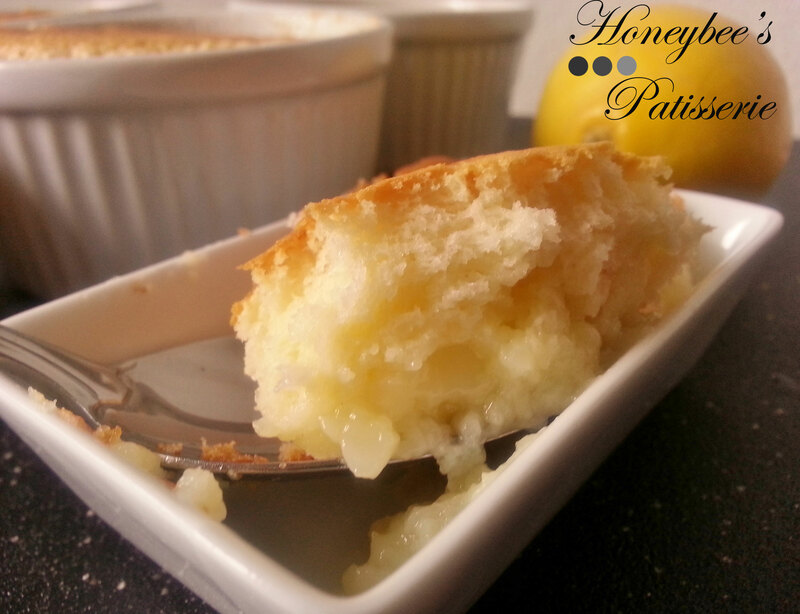 With an electric mixer, beat ½ cup sugar, butter, and lemon extract on medium-high speed until light and fluffy. Beat in yolks, one at a time, until incorporated. Reduce speed to medium-low and add the flour mixture, mixing until incorporated. Slowly add the milk and lemon juice, mixing until just combined. In the bowl of a stand mixer fitted with the whisk attachment, beat egg whites on medium-high speed until soft peaks form. As mixer continues to run, slowly and evenly add the remaining sugar until the whites become firm and appear glossy. Whisk 1/3 of the whites into the cake batter. Gently fold the remaining whites, one scoop at a time, until well combined. Spoon the batter evenly into each prepared ramekin. Carefully place pan on the lowest oven rack and pour boiling water into the pan until the water comes halfway up the sides of the ramekins. Bake until the surface becomes golden brown and the edges are set. The center should jiggle slightly if gently shaken, about 1 hour. Remove from the oven and transfer to a wire rack and allow to cool at least 15 minutes. Serve while warm or at room temperature.